44-Piece Cake Decorating Kit Just $17.99! Down From $40! You are here: Home / Great Deals / Amazon Deals / 44-Piece Cake Decorating Kit Just $17.99! Down From $40! If you love decorating cakes then this is for you! Amazon is currently offering this 44-Piece Cake Decorating Kit for just $17.99 down from $39.99 PLUS FREE shipping with Amazon Prime or for orders over $25! Have you ever been amazed by some beautifully frosted cakes and cupcakes? And thought such cakes must be made by very talented professional cake decorator? Well, not really! 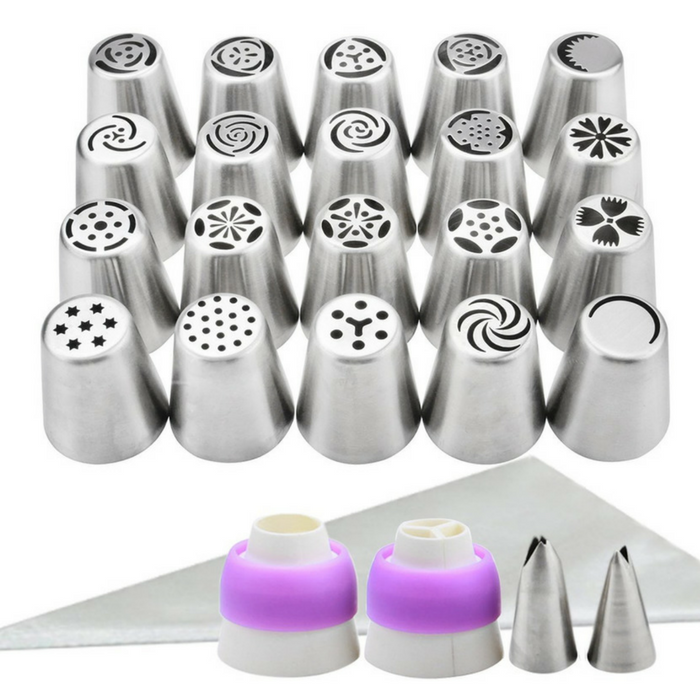 With this Russian piping tips set, you can also make exquisite buttercream flowers and even better designed cupcake bouquets in just a few minutes at your own kitchen! Amazing! Best Baking Supplier that Makes You A PRO!– Within the package, you will find a colorful tip chart which shows what flower each icing Russian tips makes, along with piping instructions and buttercream icing recipes, plus bonus YouTube tutorial sent after order; Now everyone can make stunning buttercream flowers and cupcake bouquets like a professional baker with this baking tools. Storage Box Included — A storage box with detachable slots is included to keep all the Russian cake tips and accessories in place and keep your kitchen organized.